The Hollywood sexiest couple “Bradgelina” Brad Pitt and Angelina Jolie have been named “Couple of the Year 2007” by Us Weekly. Us Weekly said they were picked because America couldn’t stop watching Jolie, 32, and Pitt, 44, as they juggled two hot careers and went from three kids to four. “Then, there’s the pair’s endless humanitarian work: Jolie recently supported her man in New Orleans as he announced plans to build 150 more home there by next summer,” said Us Weekly. 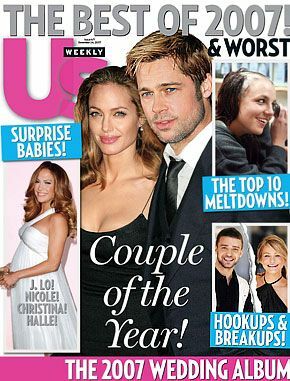 The “Couple Of The Year” was appeared on the cover of Us Weekly again. Can’t tell how many times they have been the cover couple but they deserve to be the Couple of the Year. This entry was posted on Saturday, December 15th, 2007 at 6:07 pm	and is filed under Celebrity News. You can leave a response, or trackback from your own site.